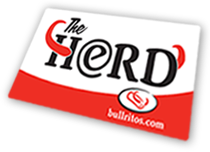 Get your Herd Card at any Bullritos location. We will use this information to process your requests. But we will not intentionally sell, share, or distribute your personal information to third parties, except as required by law.